Here's a record whose cover I've seen posted around the jazz bloggosphere and on collector sites, but no one seems to have uploaded the music. I have a copy, so here's what the John Plonsky Quintet sounded like. John Plonsky was a journeyman trumpet player, composer and arranger from the West Coast who had recorded with Ray Bauduc and Nappy Lamare in the '40s, starting out in traditional and swing styles. He later switched to a more bop-oriented approach after coming to the East Coast with Alvy West's Little Band. This recording was only his third time in the studio during his career, and it was his first time as a leader. It would be his last. What happened to John Plonsky after this is unknown, at least to me. There are several aspects to this record that make it stand out. The first is purely cosmetic, but I confess it is the sole reason I picked this record up: its decidedly unhip cover. An apotheosis of bad concept, design and execution, the album front has the band, looking tentative and uncomfortable, superimposed over a snowy background. These guys are cool, get it? Golden Crest, the album's label, is the outfit that produced all those bright red and yellow children's records that I remember from my youth. Clearly jazz was a stretch for them, despite the fact that they issued a number of good jazz LPs. "Cool Man Cool" made me laugh, and I laid out four bits for it at my radio station's music sale a few years ago. The second standout feature of "Cool Man Cool" is the band's instrumentation. With an electric accordion and a baritone saxophone backing up the trumpet's lead, you'd think the sound would be quite annoying. But no – it is remarkably coherent and nuanced. Plonsky talks about how accordionist Dominic Cortese muffles his instrument to "eliminate the reedy sound." He does and the result is very interesting. Two additional notes. Dizzy Gillespie recorded as a sideman for a vocalist back in the mid'-40s and, because he was under contract to Victor, used a pseudonym on the label. They name he chose? "John Plonsky." The bassist on "Cool Man Cool" is Chet Amsterdam. I knew him briefly when I hosted a weekly live jazz program over WJFF in the '90s. Chet would occasionally play in the show's rhythm section, but was in poor health, suffering from what one of my other musician friends describe as the "habit" that afflicted so many great players from the '40s and '50s. He was, at one time, an excellent player with much promise. See the review from the July 1957 issue of Metronome above. As always, these files were ripped from the original vinyl with only a very minor cleaning up of pops and crackles. Vermont native John Williams has has long been eclipsed by his classical and pop namesake, but at the time of this recording – 1954 – he was a rising young star with real promise in the jazz idiom. A tasteful soloist and occasional composer, he had joined Charlie Barnet's big band in 1951 after a stint in the Army (where he played baritone horn!) and then moved on to Stan Getz's quartet, his steady gig at the time of this Emarcy recording. This EP contains four of the eight tunes that eventually comprised Williams' first recording as a leader, but they give a good sampling of John's skill as a soloist – nothing flashy, just thoughtful and swinging. Williams would go on to make a second record for Mercury (Emarcy) and record as a sideman with such luminaries as Al Cohn, Zoot Sims and Cannonball Adderley. The critics applauded this first effort, as can be seen in the Metronome review from May 1955 above (of the complete LP). While John Williams still plays (or at least did up until 2004), he dropped out of sight in the 1960s to become a full-time banker and eventually became a city commissioner in Hollywood, Florida. This little EP I picked up at a church rummage sale a couple decades back and always liked it, so even though you can get the complete John Williams on Emarcy for a stiff price at Amazon (an import), I thought it was worth sharing with other inquiring jazz minds. A 1952 ad for Les Paul's answer to Fender's Telecaster. In the early '50s, Gibson made an effort to woo jazz players away from its competitor Fender by hiring Les Paul to develop a solid-body electric. They promoted their new instrument with full-page ads in various jazz magazines, touting its "wonderful tone" and featuring inventor Lester (and occasionally the long-suffering Mary Ford) along with the instrument. Jazz string players were not impressed (with the single exception of Jim Hall, as far as I can determine), and Gibson soon switched its promotion to the emerging rock 'n' roll field. If you were prescient enough in 1953 to pick up a "Goldtop" for its asking-price of $250, you could pull down a cool $25K for it in today's collectors's market. Now that's a sensation! Earlier this year, the National Jazz Museum in Harlem, New York, acquired a fabled trove of recordings made from radio broadcasts originally aired in the 1930s. The collection was long rumored to exist but its whereabouts was unknown until recently. Now the collection of William Savory – a Columbia recording engineer with an enthusiasm for recording live jazz – is in good hands and is slated to be made available to the public (assuming copyright issues can be resolved). 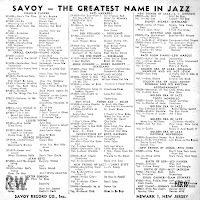 Savory recorded radio broadcasts at 33-1/3 rpm using huge 16-inch discs and was thus able to capture extended performances at a time when conventional technology limited jazz pieces to three minutes. 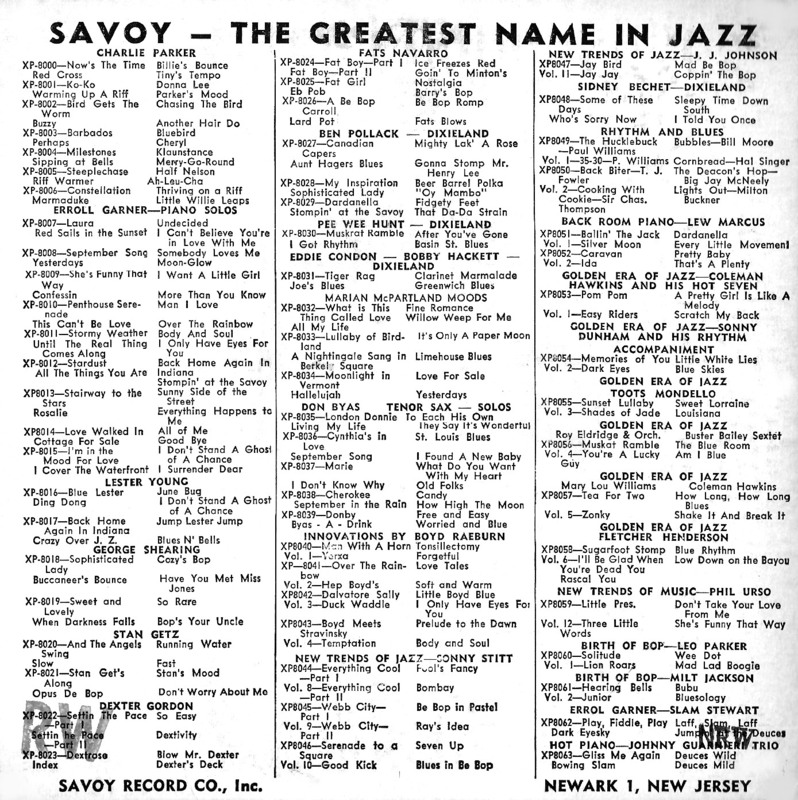 A fine pianist in addition to everything else, Savory was a big fan of Benny Goodman's, and was responsible for transferring BG's famed Carnegie Hall concerts to LP in 1953. The gag photo above was taken right around the time he was working on the project. Savory was such a fan of Benny's, he eventually married Goodman's vocalist, Helen Ward. He died in 2004. To learn more about the archive and about Savory, visit the National Jazz Museum. This was Teddy Wilson's first recording session under his own name in three years. In the early '40s, Teddy had recorded extensively for the Musicraft label, but with the emergence of bebop his elegant swing improvisations were less in demand. His date for Columbia comprised one of the company's first extended-play "Piano Moods" sessions, and it featured a quick succession of familiar tunes rendered in Wilson's impeccable style. Teddy reportedly only listened to classical music in his off hours and it certainly shows here. 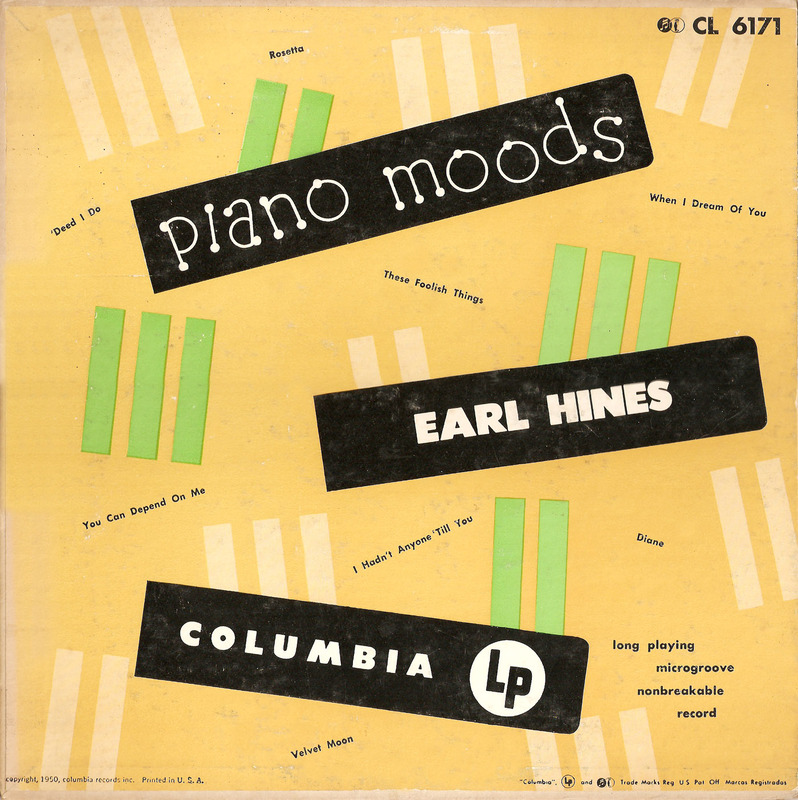 The recording makes an interesting compliment to the Earl Hines "Piano Moods" record further down this page. 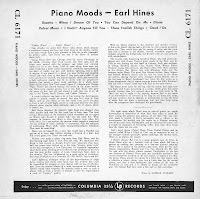 Wilson rounds edges and straightens the way where Hines prefers to keep the listeners guessing (though less so on "Moods" than on other recordings). You'll note that the folks at Columbia made a hash of the sidemen's names and instruments, but I've corrected them here. I've forgotten where I picked this LP up, but it is in excellent shape for a record two years shy of retirement age. Here's Earl Hines after he'd abandoned the big band and had quit Louis Armstrong's first all-star group. He was working mostly in trio and quartet settings at the time and, judging by trade magazines from the period, was keeping a pretty low profile. Columbia Records was experimenting with long-playing 33 1/3-rpm records, and decided to issue a series of "extended play" albums – 10-inch discs – featuring pianists. Hines was one of them. What was unusual about these records was that there were no pauses or separations between tunes – each side of the EP was one continuous performance. In keeping with the marketing angle, the performances on these albums are unchallenging and fairly perfunctory. 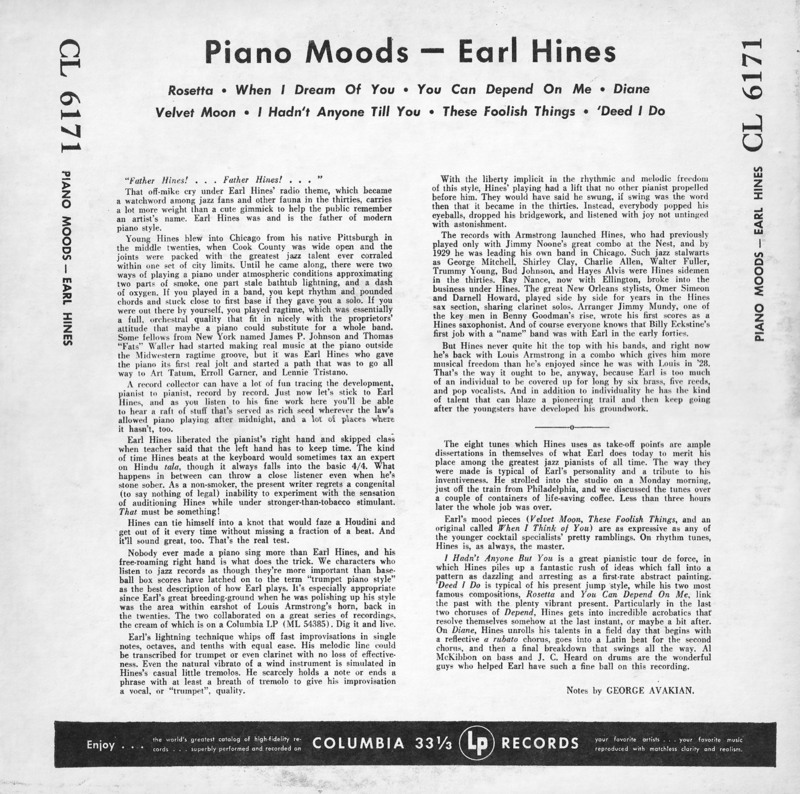 But there are stellar moments, and Earl Hines demonstrates his great skill on "I Hadn't Anyone But You" and breaks into some surprising Latin rhythms on "Diane." This album is a thrift shop find, one of several interesting records discovered among hundreds crammed into a shopping cart doing duty as a record rack. It was hell to look through but well worth the effort, as it turned out. This posting starts off our Piano Series. 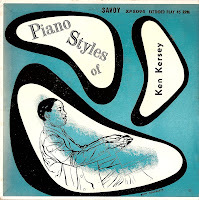 Like Oscar Peterson a generation later, Kenny Kersey was a Canadian pianist who was quite active on the American jazz scene. From the mid-thirties to the late fifties he worked with the orchestras of Lucky Millinder, Andy Kirk and Cootie Williams, and backed singers of quality like Billie Holiday. As a sideman, he made innumerable small group recordings for independent labels, playing with many of the jazz greats. Oddly though, he recorded only a handful of sessions under his own name. This very rare Savoy date was the first of those. Kersey's playing here is very much in the Teddy Wilson/Art Tatum mold, showing none of the influence of bebop. 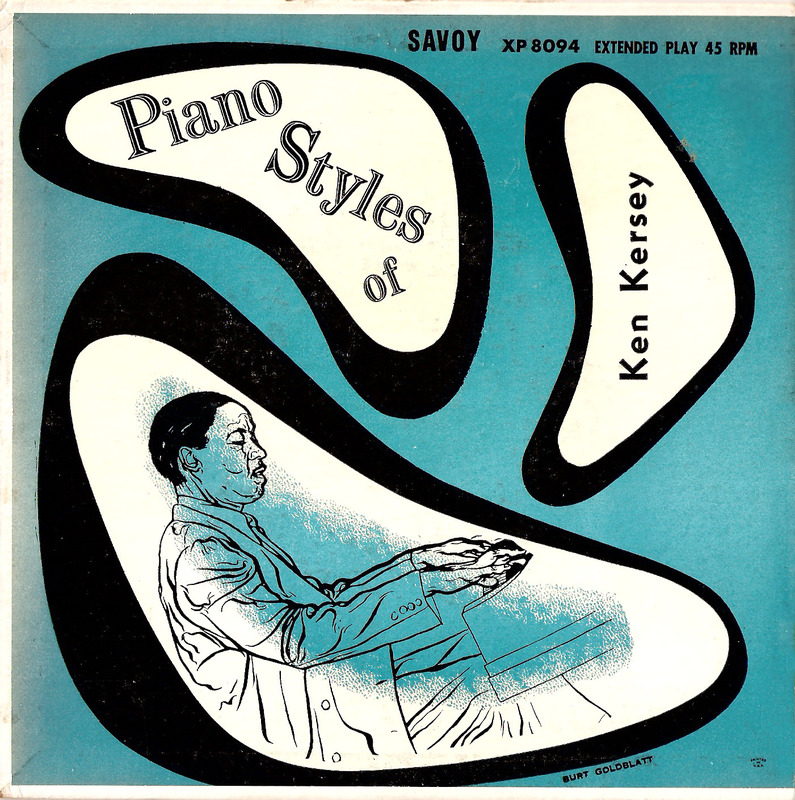 Though Kersey is often given credit – along with Clyde Hart – for being a stylistic bridge between swing and modern piano playing, his performance on these sides are solidly in the swing tradition. Jack Foster's guitar work is fleet and complimentary, evoking the styles of Oscar Moore and Al Casey. Ironically, this date is his only known recording session – and nothing more is known about him. Billy Taylor is perhaps best known for his stint with Duke Ellington where he was one of two bass players – the other being the great Jimmy Blanton. This 45-rpm record came from a trove of LPs – mostly jazz – that a friend of a friend who cleans out homes for extra income found stored in an attic. She knew I was a jazz maven and offered to sell me the lot for a pittance. I, of course, took her up on the deal, and this Kersey disc was one of the more interesting items included in it. I'll be featuring other gems from the lot in upcoming posts. As always, ripped from the original vinyl with no enhancement other than a mild cleaning up of minor clicks and pops.